Team OCO will be returning to this year’s International Economic Development Council Annual Conference. 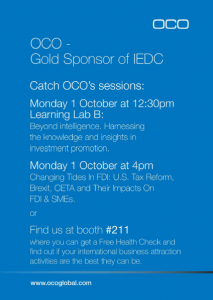 From 30th September to 3rd October 2018, IEDC brings together key figures and organisations in global economic development in Atlanta, Georgia. You can find us at Booth # 211, to speak to our experts on Exporting, Marketing Services and our prospecting tool Velociti.